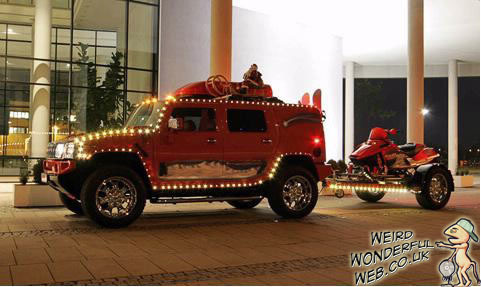 Weird Wonderful Web: Santa went on Pimp My Sleigh! Now this Christmas car looks cool. A Hummer and trailer carrying a snowmobile. All decked out with Christmas bling. Just look at Santa's new rims dawg! Looks like Santa went on Pimp My Sleigh! *Most depressing Xmas decorated car. *Another Xmas car with added pine tree.